In lieu of frying dried peppers in oil then puréeing them as per traditional Mexican recipes, this one just uses chipotle peppers in adobo. This soup actually had its genesis at the same time as our chicken filling for taco night. 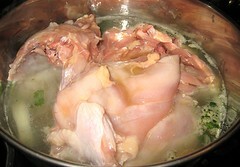 If you recall, I poached the chicken in some water with onions, Mexican oregano and cilantro. 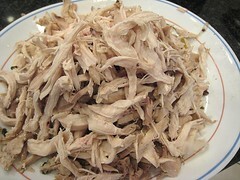 I then shredded the chicken. 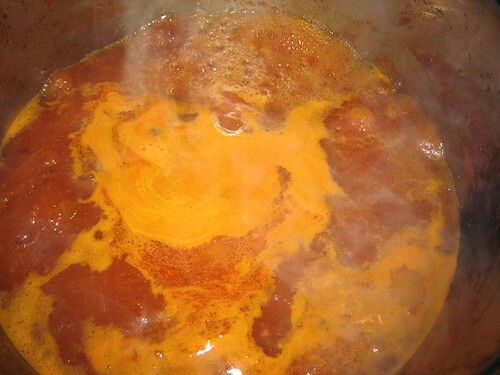 I used some for our chicken filling and some for this soup. Of course, I saved the resulting liquid. 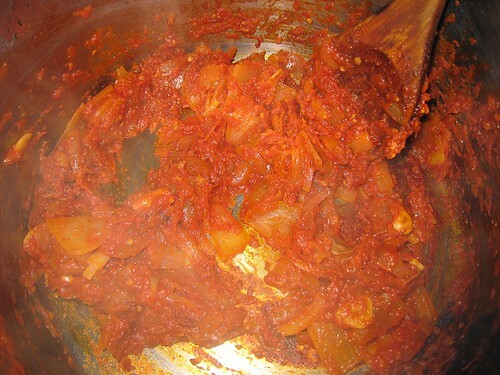 The soup base is simply onions (1 or 2), tomatoes (1 to 3) and anywhere from 1 to 4 chipotle peppers in adobo. I usually buzz them together in the food processor. In this case, though, I just sliced the onions while the tomatoes and chipotles got buzzed. 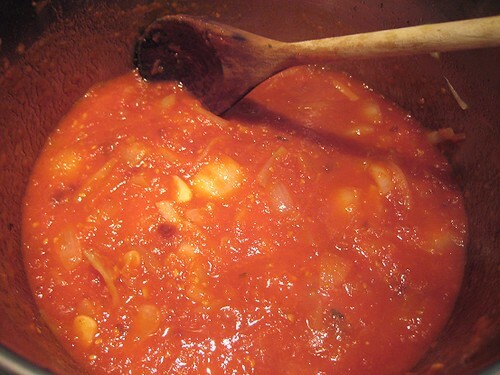 I've used fresh tomatoes and canned tomatoes. Both works for me. Then, it's a straight dump-into-the-pot. This is where most of the waiting happens. 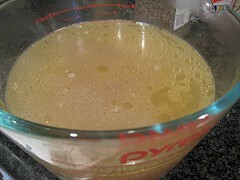 The liquid mass above has to turn into a solid mass like below. This could take anywhere from 10 to 20 minutes. The broth goes in and gets boiled. The chicken goes in and gets heated through. Then it's assemble at your will. We've fake-fried tortilla before (in the oven) to make them crisp. 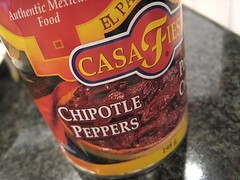 This time, we just used Que Pasa tortilla chips. Condiments include cilantro, lime, minced onion and queso fresco. RECIPE: Click here for the recipe. Been on a Mexican bent here too. Soup recipe inspired ground wild pork version here. Its the Adobo. Makes it all so easy and quick. Yours looks really good. I will try Feta one day, sounds interesting. Queso is well worth the effort though, knocks the ice-pick sensation off our fresh grated Jalapeno topping. Hey, what is this grated jalapeno topping? Is it just grated jalapenos? Or is there more? Will definitely try that. And yes, I think next time we do have to scour the city for queso fresco. Yep, just fine, fine particles of the hottest raw Jalapeno you can find. A crisp red one is your best hope. Sprinkle lightly over the surface of finished plate. Do not touch eyes. The floating little globs of melted cheese, with pepper dots, OMG. 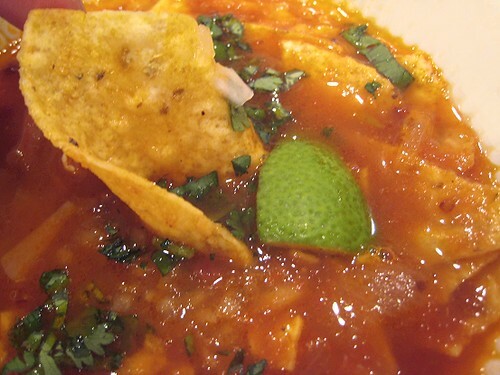 Watched the rednecks in Houston do this to canned tomato soup and even it was really good..... Just do it, everything Mexican.